ComScore indicates traffic to the broadsheet’s website is up 23% over last year, but it hasn’t translated to staff stability just yet. Media site The Wrap spoke with Jimmy Orr, who issued a staff memo and discussed in an interview with the site how “increasingly aggressive online reporting, posting stories earlier and more frequently, innovations in storytelling and presentation, and the most compelling content online” is driving the Los Angeles Times‘ web strategy and says the LAT is working to catch up with the New York Times. The East Coast paper’s site is the nation’s most frequently visited site for news, even despite the recent, controversial decision to put some of the Gray Lady’s content behind a paywall. 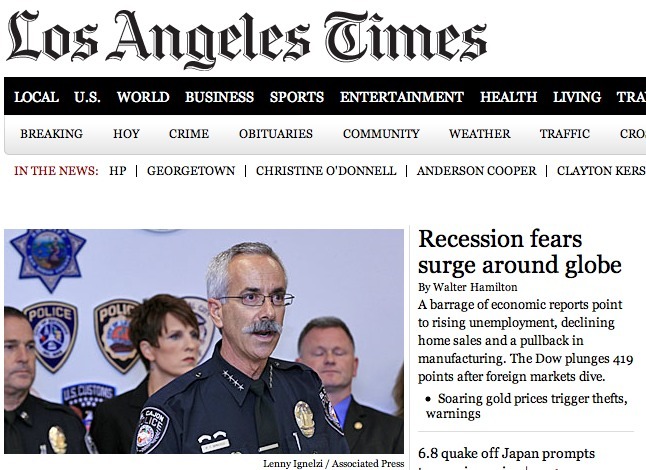 The LAT sits at about half the traffic level the NYT pulls, at roughly 32 million per month versus about 17 million. However, the former is up 23% in July over last year, compared to the NYT‘s 1% increase over the same month in 2010.